Fountain Inn, S.C. – AVX Corp. has introduced a new series of tantalum polymer capacitors designed to provide small, high energy, low profile solutions for solid-state drive (SSD) applications. Touting low ESR and the highest energy per volume (Joules/cc) of any comparable SMT capacitor currently available on the market, the new J-CAP Series solid tantalum electrolytic chip capacitors feature conductive polymer electrodes, which exhibit a benign failure mode under recommended use conditions, and undertab terminations, which enable high volumetric efficiency in small, low profile case sizes, said AVX. AVX said these features reduce both cost and footprint in multilevel cell (MLC), single-level cell (SLC), enterprise flash drive (EFD), and PCI Express (PCIe) SSDs, in addition to memory cards, battery-powered portable electronic equipment, industrial alarms, smart power meters, and mobile devices, such as cell phones, tablets, and wearable electronics. 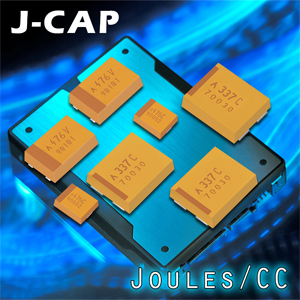 The J-CAP Series devices claim the highest energy per volume - up to 32.7mJ/cc – that allow SSD designers to take advantage of the latest voltage regulators. The maximum energy per case size is as follows: L = 3.3mJ, T = 4.7mJ, X = 14.9mJ, and 4 = 32.7mJ. AVX is developing higher maximum energy ratings for each case size. The series is currently available in four case sizes, the EIA Metric and AVX code, as follows: 3528-10 (L), 3528-12 (T), 7343-15 (X), and 7361-20 (4). A fifth, 7361-15 (3), is currently in development. Other key specs include a capacitance range of 4.7µF to 1,500µF, a ±20% capacitance tolerance, and four voltage ratings of 6.3 V, 16 V, 25 V, and 35 V. A 50-V version is under development. The operating temperature range is -55°C to +105°C. Devices are RoHS compliant and lead-free compatible with pure tin-plated terminations. Availability: Shipped on 7” and 13" reels, lead time is 8–12 weeks.